His Highness Sheikh Mohammed bin Rashid Al Maktoum, Vice-President and Prime Minister of the UAE and Ruler of Dubai, has approved Dubai Cruise Terminal at Dubai Harbour as the main hub for cruise tourism in the emirate. He also attended the signing ceremony of a strategic partnership agreement between Meraas and Carnival Corporation that aims to transform Dubai into a major regional maritime tourism hub. Under the agreement, signed by Abdulla Al Habbai, group chairman of Meraas, and Arnold W Donald, chief executive officer of Carnival Corporation, the companies will collaborate across several strategic areas including port development, terminal management and new cruise development opportunities at Dubai Harbour and the broader region. Dubai is set to become central to Carnival Corporation’s operations in the region. The agreement mandates Carnival Corporation to assist Meraas in ensuring the cruise terminal meets the highest international standards of the cruise industry, while the relevant authorities will be responsible for security, immigration and customs. Operations at the Dubai Cruise Terminal are scheduled to commence in October 2020 as the main cruise terminal in Dubai and all cruise ships visiting Port Rashid will be redirected gradually from its opening date. According to the Cruise Lines Industry Association (CLIA), more than 40 million people worldwide will travel on cruise ships annually by 2030, marking a 40 per cent increase from 26 million passengers in 2017. At a local level, the maritime tourism sector is expected to contribute more than Dh1.5 billion ($408.35 million) to Dubai’s economy by 2030. The Dubai Cruise Terminal at Dubai Harbour will become Carnival Corporation’s primary hub for its homeporting and transit operations in the region. The partnership will also result in both parties working together to identify and grow the cruise tourism business in the Arabian Gulf region. Carnival Corporation will launch new cruises from Dubai Cruise Terminal and it aims to attract India and China. The cruise terminal is designed as a strategic maritime centre, providing easy access to and from the city, while offering passengers an unparalleled view of iconic landmarks, such as Ain Dubai and the upcoming Dubai Lighthouse, as well as the Dubai’s stunning urban skyline. Dubai Harbour will be home to two cruise terminal buildings, spanning a total of 30,000 sq m, joined by a single quay of about one kilometre, capable of accommodating up to three cruise ships concurrently, including Carnival Corporation’s newest and most advanced cruise ships and XL class ships, as well as up to 13,200 passengers at a time. In anticipation of an upsurge in cruises, Meraas has planned for the addition of two more terminal buildings that will increase capacity to six cruise ships at the same time. Launched in January 2017 by HH Sheikh Mohammed, Dubai Harbour will be located on King Salman bin Abdulaziz Al Saud Street in the Mina Seyahi area and is set to span 20 million sq ft. 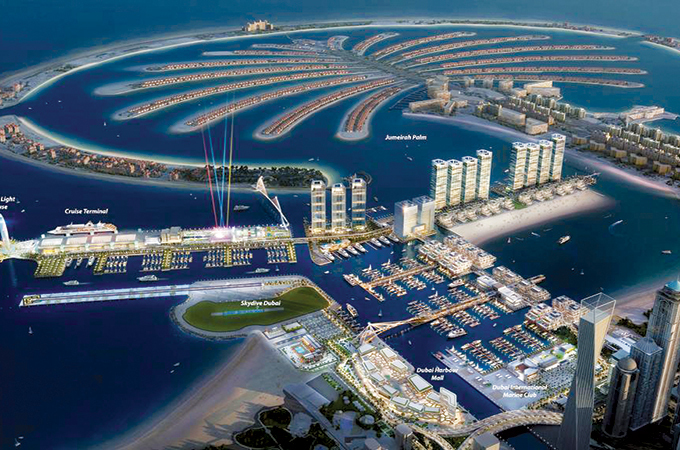 The development will feature a shopping mall, luxury residential units, restaurants, cafés, hotels and a yacht club, as well as Dubai Lighthouse, a 135-m-high architectural masterpiece with a viewing platform offering stunning panoramic views of Dubai. The project is being developed in phases and will create synergies with some of Dubai’s other iconic projects located in the area, including Bluewaters. Dubai to become base for RCI cruise ship?